Eighteen months ago our own sneaky Susan Omand watched one of Amazon's Pilot shows called Sneaky Pete which, having compared it to limited edition ice-cream, she decided she really enjoyed - you can read the full review here. Imagine her delight, then, at finding out that the full season is now making its way onto Amazon Prime in January. 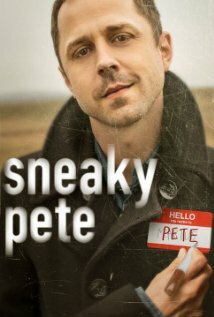 Sneaky Pete revolves around a con man, Marius (Giovanni Ribisi) who, with nowhere else to turn on his release from prison, takes cover from his past and the vicious gangster (Bryan Cranston) he once robbed, by assuming the identity of his cellmate, Pete, and then “reunites” with Pete's estranged family—who have no reason to suspect he's not their long-lost loved one. When the gangster holds his brother Eddie (Mr Robot's Michael Drayer) hostage for ransom, Marius must find a way to free him while at the same time struggling to keep his lies from backfiring. Meanwhile, his new “relatives” are a colourful group who give him a taste of the loving family he's never had, but have secrets and lies of their own that threaten to drag Marius into a world every bit as dangerous as the one he's trying to escape.